Earn Reward Points for shopping at Banyan Pilot Shop. For every $1 in merchandise purchased, members receive 1 point. Banyan Pilot Shop Loyalty Card members earn Reward Points for purchases made in person at the pilot shop. For every $1 in merchandise purchased, members will be rewarded with one point. Once members have earned 300 points or more to their account, they will be able to redeem points in increments of 300. Loyalty Card Rewards Program members will receive a $10 purchase credit for every 300 points redeemed. To sign up for a Banyan Pilot Shop Loyalty Card, please visit our pilot shop at Fort Lauderdale Executive Airport (FXE). One of our friendly sales representatives will be able take your basic information with your email address and immediately issue and activate your new card. Once signed up, any in-store purchases will accumulate rewards points. Participation in the Banyan Pilot Shop Loyalty Card Rewards Program is FREE. Loyalty points accumulate and are accepted towards in-store purchases only. Points from this program cannot be accumulated or redeemed at Banyan Air Services. Members earn 1 point for every $1 of eligible purchases. To earn points, members must present either their membership card or provide identifying information at the time of purchase. Points awarded on purchases will be posted to the loyalty card member’s account for redemption 30 days after the purchase. All points will be kept on the customers loyalty account and can be redeemed in $10.00 (300 point) increments. No change or cash return will be given on a transaction. Special order items and taxes are excluded from earning points in this program. Banyan Pilot Shop Loyalty Points have no cash value and no change will be given. Banyan Pilot Shop Loyalty Points cannot be awarded for purchases made prior to enrollment. Banyan Pilot Shop Loyalty Points can only be applied to the account belonging to the individual person making the purchase. Identification will be required. Banyan Pilot Shop Loyalty Points earned will be adjusted for all merchandise returned for refund. Banyan reserves the right to change the Loyalty Card Rewards Program terms at any time. Learning how to fly can be both a challenging and expensive goal to accomplish. We understand, that’s why we created our student pilot discount program. Not sure what to get your favorite pilot? 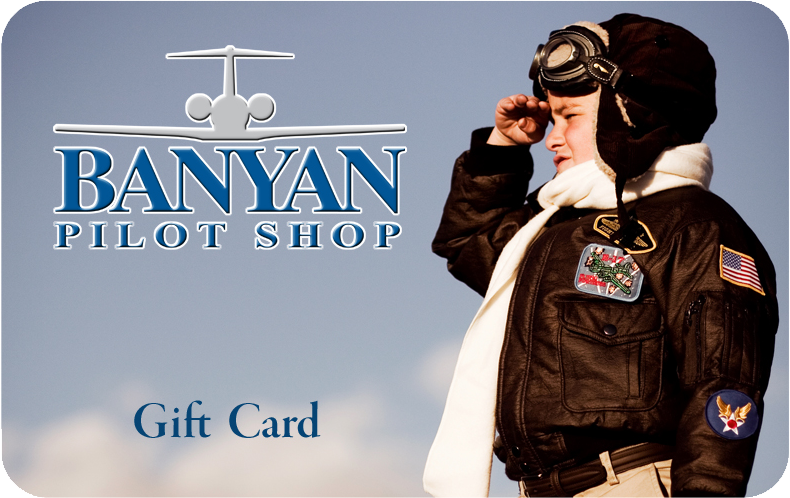 Give them a Banyan Pilot Shop Gift Card and let them choose from our extensive selection of pilot supplies and aviation themed gifts. Gift Cards are available in any amount and can only be purchased by visiting Banyan Pilot Shop’s store location. If you are in an aviation-related business and in need of FAA charts for the US and Caribbean, Banyan Pilot Shop offers the perfect solution for your business to business needs. If you would like further information on our chart reseller program, please email pcharles@banyanair.com and we will get back to you right away. Thank you for considering Banyan Pilot Shop for your business to business charting needs.